When Epic first got together, we knew right away that it would be difficult for some of the members of our quartet to keep up financially with the requirements of being in a competitive quartet. But we had a fantastic chemistry with each other and we liked the noises we were making together, so we decided that we would get together anyway and trust that hard work and dedication to the quartet would help us provide for each other. Luckily, there is one member of Epic who is a shop-a-holic and is willing to front her own personal money for our crazy shoe habit and always-expanding wardrobe! So that means that the money we earn from our fundraiser events and from gigs is dedicated entirely to the business of the quartet–traveling to competitions, registering to be in those competitions and paying our amazingly talented arrangers for the rights to sing their songs. Once again, we are asking for your support in order to get Epic to Orlando. The event registrations are due September 15 so we have set a goal to earn the money we need by September 1. 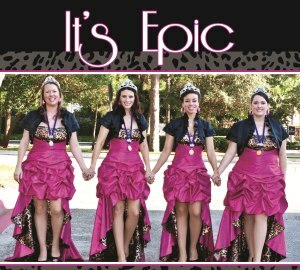 We are again indebted to Julia Duke, a Thirty-One sales consultant, for putting all the proceeds into Epic’s pocket. We couldn’t ask for a better fan and a better friend!! Please take a moment to check out our online party and consider placing an order to help us out. NEW THIS TIME… Thirty-One just launched icons as part of its team spirit line and OMG they have a CROWN icon!!! Yay!! If you are talented enough to have earned one, or if it’s your dream to someday earn one, why not get yourself a rehearsal/music bag with a CROWN and your name on it!!??? We love it! You can also join our “event” on Facebook to show your support. We are more appreciative than you will ever know!!! Thanks for helping us support our dream!